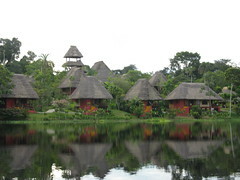 Our last five days in Ecuador were spent in the Amazon basin at an eco-lodge called the Napo Wildlife Centre (NWC). 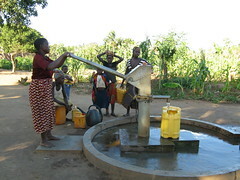 The lodge is owned and operated by a local community, so all the profits directly benefit the community and its people. We were impressed with the lodge – the accommodations were great; we had a huge room with a king sized bed (covered of course with a mosquito net), and a large bathroom with hot water. The food was delicious, the staff friendly and always helpful and our guides (one local and one naturalist guide) were both very good and quite knowledgeable. Another plus for this lodge was that they treat their wastewater in an ecologically friendly way (using reed beds), which for me was an important factor in selecting the lodge. On our last day in Quito, we opted to stay in town since we were leaving the next day for the Amazon. We headed into the Old Town to try see a few things we missed on our previous walk about that part of town. 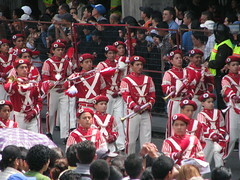 There just happened to be a parade in celebration of the upcoming Quito Festival, so we stood and watched it for a while. The parade was made up of groups from various high schools playing drums and doing some dances. From there, we went over to the Palacio del Gobierno. We had wanted to see inside it, but we were unable to once again as it would have meant standing in a long line for a considerable amount of time. Instead we headed over to the San Francisco Monastery and wandered around inside. We saw some monks, but mainly the monastery has been made into an art gallery so we looked at the art and saw the chapel which had beautiful woodwork but was under renovations. Before leaving for our trip to Ecuador, I read about some bike trips that are available there. I had done a downhill mountain biking trip in Bolivia that was a lot of fun, so we decided to try to do one in Ecuador. We signed up for a downhill trip with Biking Dutchman, a well-known outfit in Quito. When the day arrived, we got geared up and headed out early in the morning to meet our guide and the other participants. On this trip, we had two American guys join us for the day. They were really friendly and quite hilarious with stories of the debauchery on their trip so far. We headed out of town in a 4x4 with the bikes on top to our starting point. Otavalo is a small town about an hour and half North of Quito. 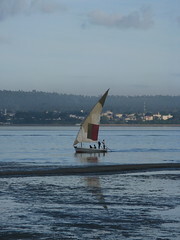 It is known for its handicraft market, which on Saturdays is bustling with people. We went on a Tuesday, which is the other day of the week it can get busy. We headed out of Quito, again on a “private” group tour, fairly early in the morning. On the way to Otavalo we stopped in Calderon, which is famous for making ‘bread dolls’, which Ecuadorians use to decorate around All Saints Day. Then we stopped at an equatorial monument. 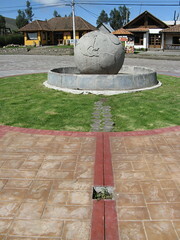 It marks where the equator is and would be the first of several such monuments we would see! We continued on to a little shop outside Otavalo with a lovely view of San Pablo lake. In between our Galapagos trip and heading to the Amazon, we had four days in Quito. We decided to go on several day trips outside of the city so that we could see a little more of the country. 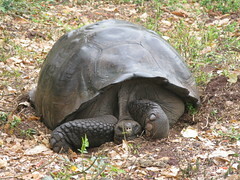 We had spent two days in Quito before the Galapagos, and felt we had seen most of what we wanted to see in Quito already. 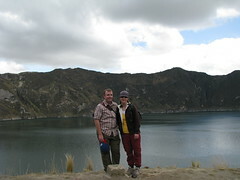 Our first trip took us to Quilotoa, a lake in a volcanic crater. 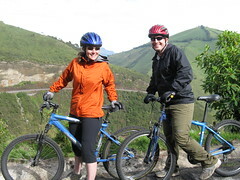 The second was to the market town of Otavalo, and the third was a downhill mountain bike trip. On our fourth day, we tried to see a few last things in Quito and got ready for our trip to the Amazon. 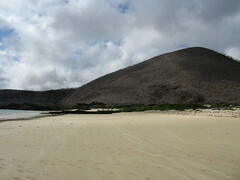 We arrived at Punto Cormorant on Floreana Island early in the morning. In the morning we went for a hike on the island where we saw the two types of beaches in Galapagos – green sand and white sand. The green sand beach had a bit of a green tinge and was quite dark. 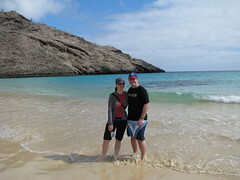 The other beach we walked on was white sand, and was so soft – it felt like walking on flour rather than sand. There was a turtle nesting area on that beach. In the shallow water we saw many sting rays feeding as the tide washed in, and the guide showed us how to walk in the water to avoid stepping on one – and getting stung! Basically you shuffle your feet without picking them up. We also saw some sea turtles in the shallow water and a few sea lions laying about. We saw a few small birds on the beach – plover, sandpiper – as well as a yellow crowned night heron and a great blue heron.